The Misfit Command sports a beautiful, fun-to-wear design that’s also eye catching, and there are enough smarts here to actually be helpful. Misfit Link is bound to your own creativity, while the notification support is great for getting simple information quickly. It won’t rock your world when it comes to activity tracking however’ you’ll get the basics, nothing more. Despite the good smarts, there are some integrations, like Speedo and Harmony, that also appear to be broken. 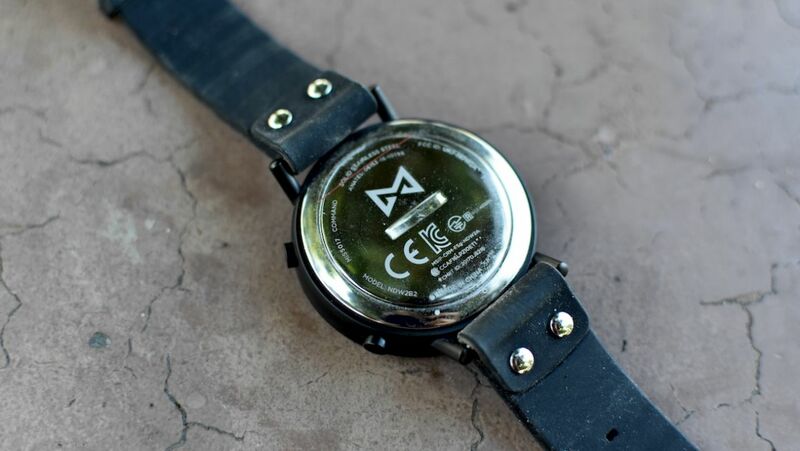 Misfit’s first attempt at a hybrid was the Phase, an elegant watch that melded a beautifully weird look with some tactile smarts, which it then shrunk down into the Path. The Misfit Command is an attempt at something a big different, and it’s ever more clear that parent company Fossil’s influence is starting to seep into the company in more ways than one. When coming from the Phase, the first thing you notice about the Command is that Fossil’s influence has grown. 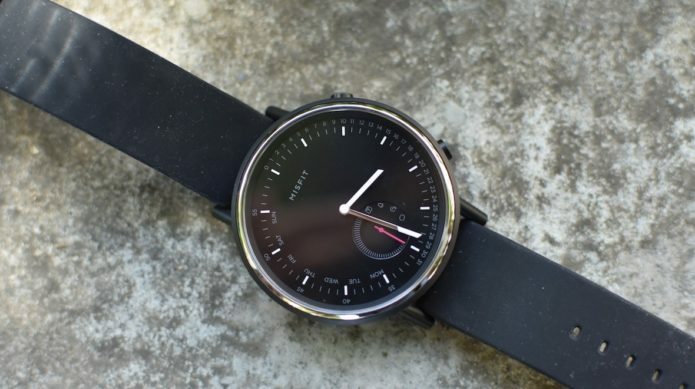 Specifically, it’s clear that Misfit looked at the Skagen Hagen Connected and took some influence from that design to craft the command. Down near the bottom of the face there’s a subdial with a whole bunch of information. On the right, the subdial lists types of notifications. There are also two buttons on the side of the Command, and when you tap the top button the red hand in the subdial will show you which smart feature you’re currently using. While there’s a ton of information on display, the Command manages to not feel busy. It still looks and feels like a minimalist smartwatch, and a lot of that has to do with how thoughtfully color is used on this watch face. The most important bits, like the hour and minute hands and the indicators for hours, are bright. Everything else is a dull grey, with only the subdial hand an alarming red. This allows you to quickly glance at the watch to get the time without getting distracted by what’s going on in your connected world. Similarly, this watch opts for a simple design – in fact, it may arguably be a simpler design than the Phase when it comes to the casing. In this case, we’ve got a stainless steel body that’s no-frills. There’s a simple steel bezel, while the rest of the body has a lovely matte finish. Seriously, the side of this watch is just nice to touch. It’s pretty embarrassing how many times I went and touched the sides of the Command just because it felt good. Similarly, the two buttons on the side also feel good. They’re a little squishy, but they’re good enough. The sport band our Command came with is a little different though. It’s comfortable, and the ridges on the underside are a nice touch to keep the band from feeling slippery when there’s sweat and muck, but this thing is also a magnet for dust and particles. It just picks up everything its path, and it’s hard to get it off until you wash it – and wash it you can, as the Command is water resistant to 50 meters. While the Command’s 44mm watch face is larger than the Phase’s 41mm watch face, the design on display here makes the Command look a little more streamlined. A lot of that has to do with newly designed – and more minimalistic – lugs. The Phase opted for a wavy, long lugs to connect to the bands, while the Command has short, barebones lugs that get straight to the point. It’s design for function, and it works much better. The Command is a great looking watch. While it clearly takes inspiration from its cousin, the Skagen Connected, it’s also got enough of its own identity in that it doesn’t look completely like anything else. It’s pretty enough to be eye catching, but there’s some distinction to it. This works, but it also took a while to get used to. The Command’s new system is much better though. When you click the top button on the right side of the device, the subdial points to a number of icons representing day and date, alarm, second time zone, notifications and Misfit Link. When the subdial’s red hand points to one of the icons, the hour and minute hands whirl around to point to information. So if they point to day and date, the hour hand will zoom over to the left side of the watch face, pointing to the day of the week – lightly scrawled onto the left side of the watch face in dull grey – while the minute hand will point to the date – on the right side of the watch face, also in dull grey. For the most part, this works pretty well. It’s nice to click over to day and date or second time zone and instantly get the information you’re looking for. Where things get a little more complicated is with app notifications, where you have to head to the companion app to designate an indicator. For instance, I set WhatsApp to 12 O’Clock. So every time I got a WhatsApp message my hour and minute hand both go and point upwards. This works, but you have to do the work to remember which number corresponds to which app. Eventually, I decided to pare down app notifications to just a couple of apps – the ones I use the most – so that I could actually remember what was coming in. You may not want to enable notifications at all for apps you use for a lot of chatting though. If you’re like me, you either have chatty friends or chatty groups. That means when messages come in, they’re barrages rather than just one or two. So when this happened, the Command would just start buzzing and vibrating almost non-stop. The worst part? The Command’s vibration game is strong. So strong that I had to eventually disable my chat app notifications because I couldn’t handle it anymore. On the plus side, the vibration strength makes the Command a great alarm, because it’s strong enough to actually wake you up from your slumber. There are four interactions: single press, double press, triple press and long press. You can assign these interactions functions like controlling music – play/pause, next, back – taking a picture, clicking through a presentation or linking up with a couple of services. These services include IFTTT, Harmony and “Ring my Phone”, which will call your phone should you lose it. The Harmony bit in the app, unfortunately, didn’t work for me. When I went to link it, it would boot me to a broken page on Misfit’s website. IFTTT support, however, did work. That will boot you to the IFTTT app, which will make you activate Misfit and then walk you through how to set up and create applets that can be activated with your Link button. This actually gives you a pretty neat way to do things like activate services or play with your smart home. While it’s handy, in practice I actually found it to be more “nice to have” than “need to have.” This isn’t something I would use on a daily basis, but it could be useful in certain situations. I could set it so a single tap would turn off all my Lifx lights, but I already have automations and schedules set up for my lights, so I don’t really need to bother turning them on or off. In cases where I do – like waking up in the middle of the night – it worked. The Command isn’t trying to give you the most detailed fitness metrics in the world. It’s giving you some very basic information, like steps, distance travelled, calories burned and your sleep. And, well, we’ve got some mixed results on that front. There’s no heart rate monitor or GPS here, so the accuracy of several metrics is already not going to be the most accurate in the world. I put the Command up against the Fitbit Charge 2 – which comes with a heart rate sensor – and found several instances where things didn’t line up. For instance, while the Command logged me at 3.3 miles walking one day, the Charge 2 had me at 4.3 miles. The Charge 2 put me at 2,917 calories burned and 9,268 steps walked, while the Command had me at 2,888 calories burned and 8,106 steps walked. The calories – surprisingly – aren’t too far apart, but a mile difference is a bit of a shocker. 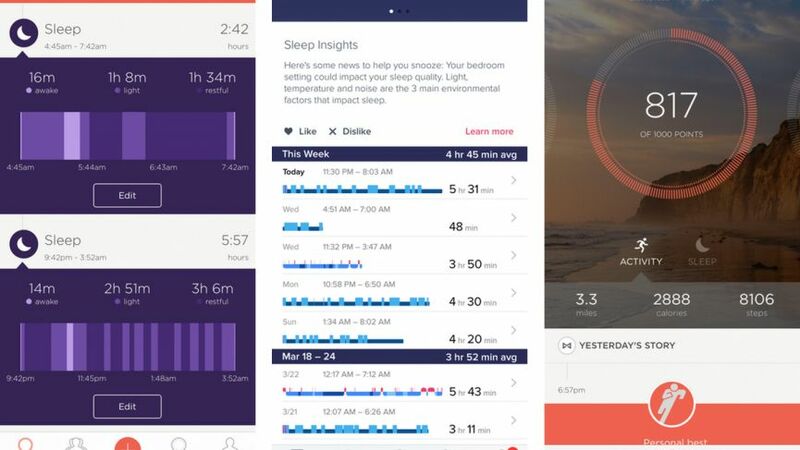 As for sleep tracking, you’re again not getting the greatest metrics out there. You’re not getting REM, for instance, instead just getting light sleep, restful and awake. Fitbit’s sleep tracking is some of the best out there on the wrist, and for the most part the Command kept up. Now, the one very odd thing about the Command is its supposed integration with Speedo On, which lets the waterproof hybrid count your laps in the pool. This is a $9.99 in-app purchase that is supposed to be activated in the Misfit app. When you enable Activity Tagging in the app, you’re supposed to be able to link the bottom button on the right side to activity tracking. However, this didn’t work for me. While Activity Tagging was on, I wasn’t able to link swimming, which in turn meant I wasn’t able to purchase and activate the Speedo On feature. It’s possible this is some kind of glitch, as it’s definitely a feature that’s listed in the in-app purchases section on the App Store – it’s even on Misfit’s website and confirmed to Wareable by Misfit PR. Our Misfit app is updated to the latest software update and is linked to our Speedo On app as well. It’s a strange situation that hopefully gets fixed up sometime soon. Overall, while the Command is capable of doing activity tracking, it’s nothing that’s going to set your world on fire. The activity tracking here is very light, and is mostly there to give you a vague idea of your daily exercise, and how far away you are from your general goals, rather than helping you get fitter.